Last week in The Times, there was article about recipes in verse. The author reckoned that rhyming recipes were once common, which he attributed to the need for a way of memorising ingredients and cooking directions in the days when few cooks could read or write. He also quoted some modern verse about cooking, including this piece below. I’d then lose all interest in eating it. where emerald basil sprouts wildly in the gutters. without a thought. Pepper. Bubbling white wine. Stock, slipping from a jug, uncalculated. Dared break the cardinal rule never to leave it. like Sunday church bells all the while, has done it. I thought that this hit a nail on the head. The best way to cook good food isn’t by following instructions in a recipe book. It’s better to absorb the rhythm of the recipe, know what you are aiming for and just do it. Of course, you also need a repertoire of techniques that by practice have become second nature. These techniques aren’t difficult or complicated but having them in your head – as opposed to reading them as you go along – makes all the difference. So, as Mary Woodward says, the way to end up with a good risotto is to make ten – and throw the first nine away. Just like woodwork really. 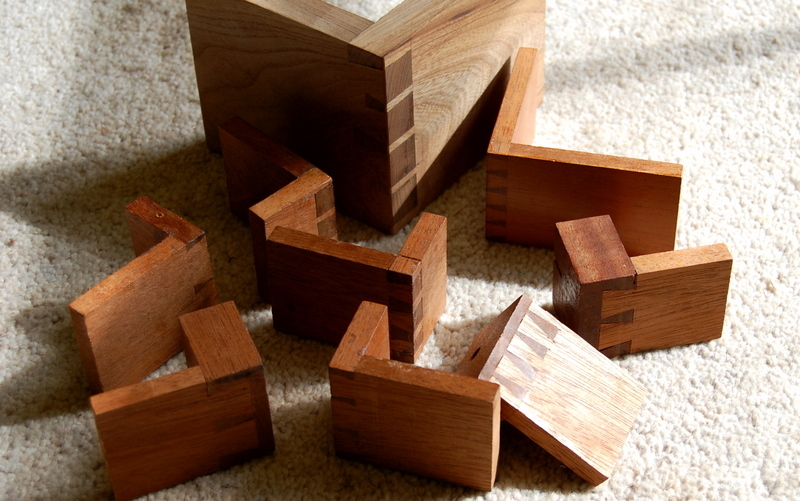 Cut a set of dovetails every day for a month and then you’ll be able to make a decent drawer. I highly recommend it as an approach. Because you’re not actually making anything, not working on a real project, mistakes don’t matter. Indeed, they’re to be welcomed as a way of learning what not to do. And it’s satisfying because you get better so quickly. Here are some of my practice pieces. Most of them aren’t very good and a couple are really poor. 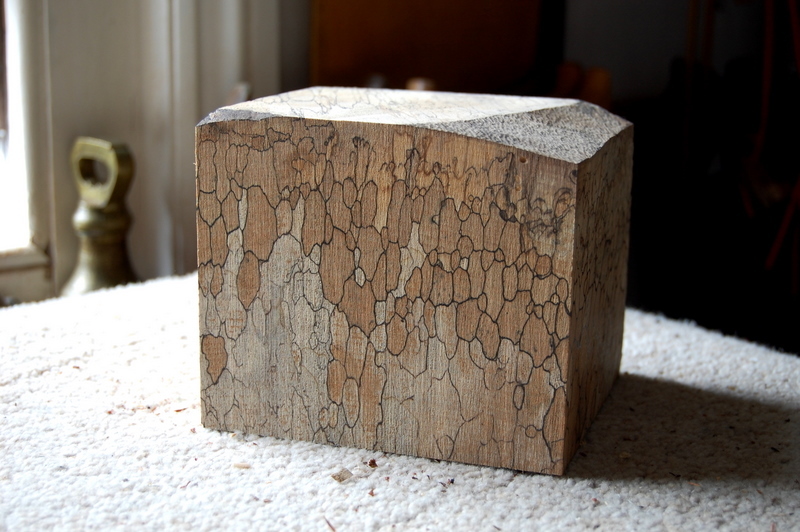 But it’s instructive to see how strong the joint is, even when made badly. I’ve kept them because small right-angled brackets often come in handy: glueing up mitred frames or boxes with mitred corner joints, for example; or holding the bottom block of a guitar vertical while glueing it to the soundboard. Although my technique still needed improving, I’d learnt enough about cutting dovetails to be able to enjoy making these drawers for a cabinet in English elm. Talking of improvement, there’s an interesting article on Konrad Sauer’s blog about how, after making a stack of drawers for his kitchen, he reached the point where his dovetails fitted straight from the saw. As a famous golfer once remarked, ‘The more I practise, the luckier I get’. Browsing through the surprisingly detailed statistics that WordPress provides for bloggers, I was intrigued to see that some of my most popular posts were about the workshop construction of small finger planes with curved soles for violin and cello making. If you’re interested and want to find them, go to the bottom of the page and type plane into the seach box. Or click here, here and here. 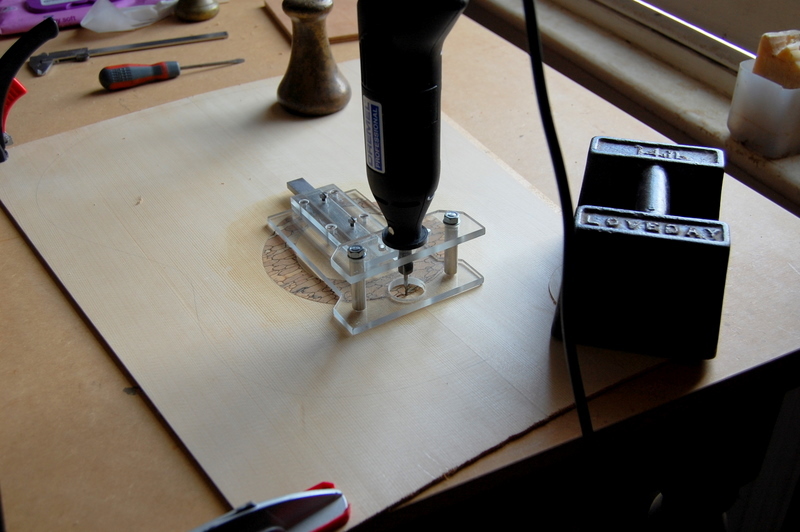 There’s also a short entry about them on the tools and jigs page. For a slightly different approach, it’s worth taking a look at Alan Dunwell’s website. You’ll need to go to the Luthier pages and select Making finger planes. He shows how to make several of these planes in a single batch, shaping different profiles for the soles on a belt sander. Dunwell recommends nothing fancier than a penny nail for the crossbar that holds the wedge and blade in position. 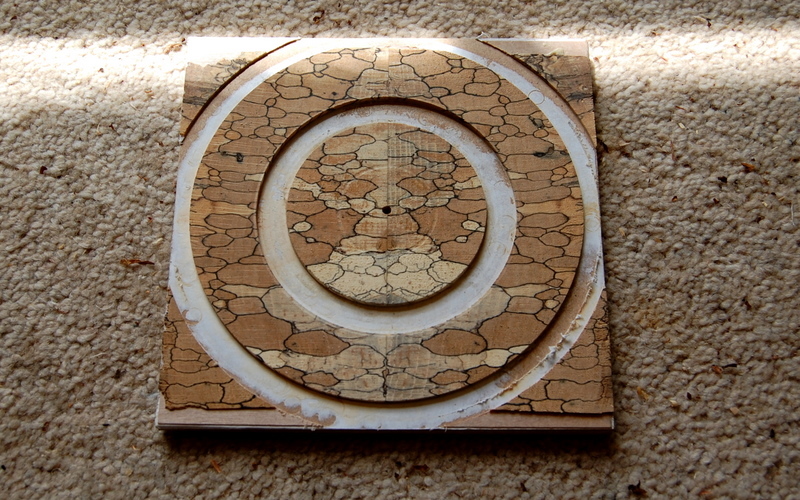 This is the second half of the story, started in my last post, about making a rosette from spalted beech. The next step was to cut the channels around the edge of the rosette to receive the border strips. Again, I used my jig mounted Dremel for this. Here the channels have been cut and the decorative strips bent more or less to the right curvature on the bending iron ready for glueing in. 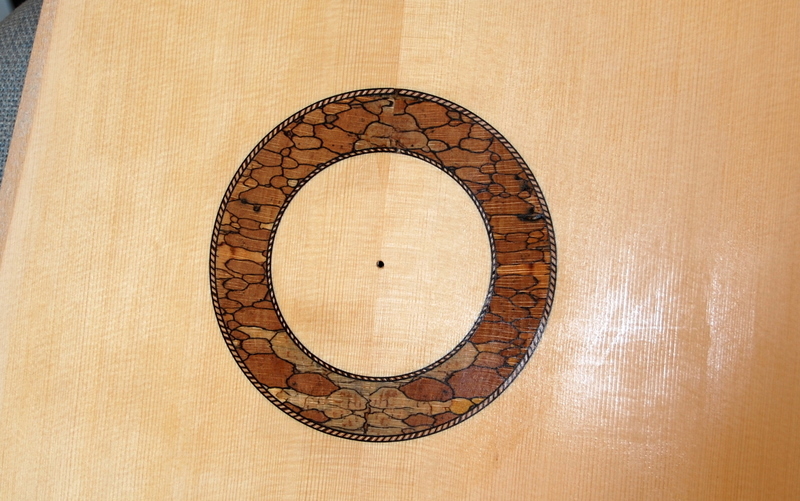 And here is the finished rosette, planed flush with the soundboard and given a wipe of shellac. 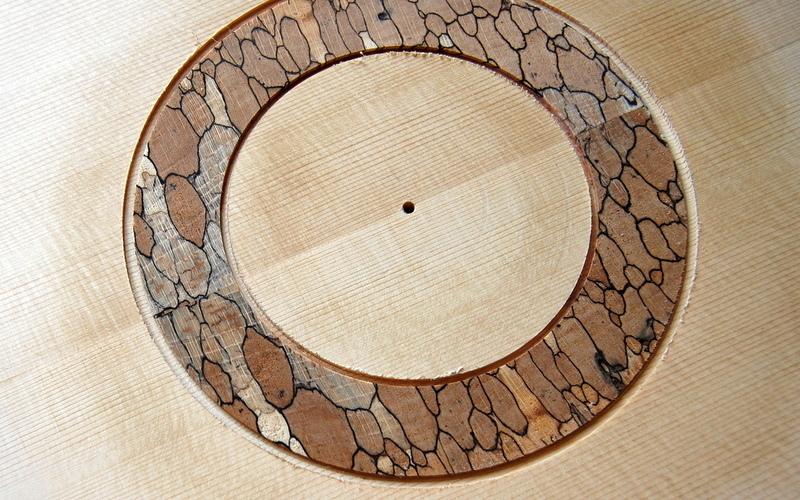 I shan’t cut the soundhole until I’ve planed the soundboard down to it final thickness. 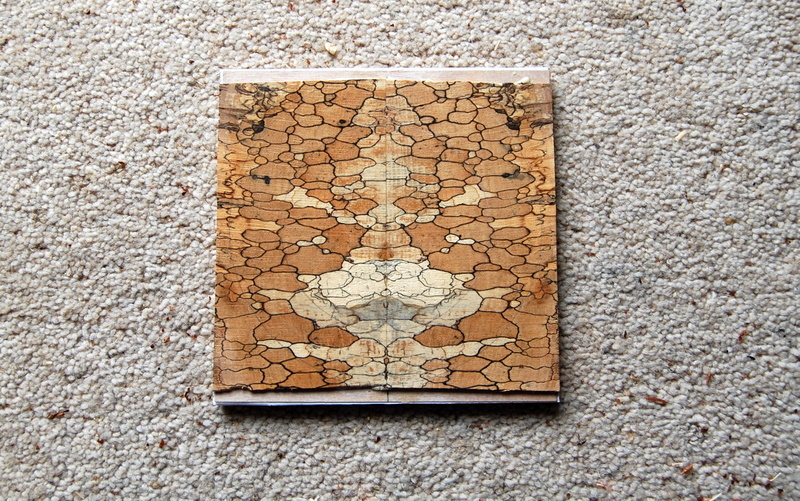 A few weeks ago, I bought a block of spalted beech from Mark Bennett and mentioned, in a previous post, that I hoped it would make some striking guitar rosettes. I’ve been trying out some ideas. Here’s the piece of wood that provided the starting point. Having decided which face looked most attractive, I set up the bandsaw for a fine cut and sawed two veneers at about 4mm thickness. Then I book-matched them to create a more or less symmetrical pattern, by gluing them onto thin (1/64 inch) plywood for stability. Actually, there’s a bit more to it than that. First, using weak hot hide glue, I stuck a sheet of paper to a 6 by 6 inch square of 6mm MDF. Then I stuck a similar sized square of 1/64 inch thick plywood over that, again using thin hide glue, and weighted it down until the glue was dry. 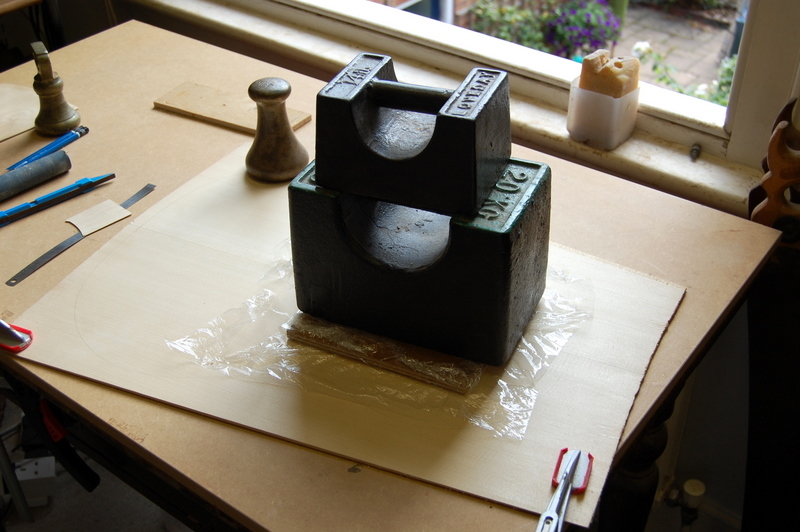 This provided the base onto which the veneers were glued. Using a Dremel mounted in a jig (details of jig available here) I cut out the rosette making the depth of cut just through the layer of thin plywood. 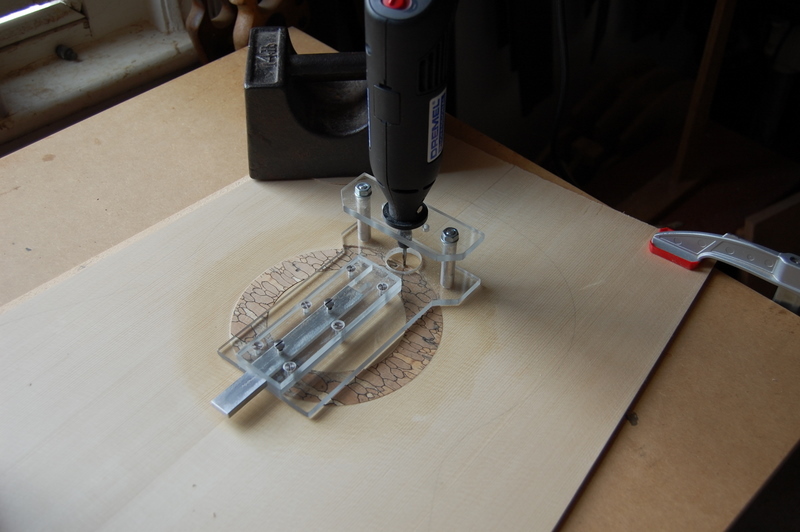 It was then possible to remove the rosette using a thin blade – an ordinary knife from the dinner table works well – sliding it between the plywood and MDF layers in the plane of cleavage provided by the paper. Any paper or glue remaining on the underside of the rosette can easily be cleaned off with a hot damp cloth, which of course was the reason for using hide glue in the first place. 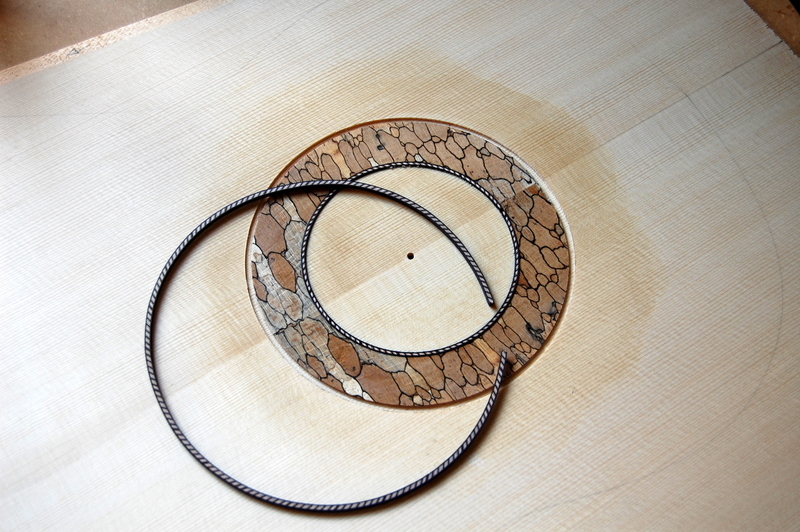 I missed the opportunity to photograph either the detached rosette or the routed channel in the soundboard but below you can see the rosette being glued into position on the soundboard, weighted down so that it dries flat.